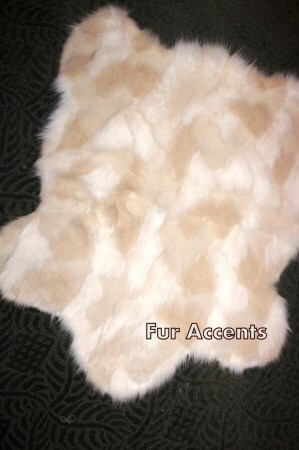 New / Plush / Faux Fur Sheepskin Accent Rug / Creamy Tan and White Patches / 30" x 36"
We have been in business since 2002 / We are Located in Southern California / We start with the Best Quality Man Made Furs / We Design our own styles, many of which are patterned after Real Animal Hides / over 2000 styles and designs in over 100 different faux fur designs / We Cut and Sew Rugs 6 days a week in our own Local So Cal Workrooms / We sell over 1000 pieces per month / We offer Complete Custom Orders and Superior Customer Service . Functional as well as Decorative, our rugs add beauty, warmth and comfort to any room. Suitable for Office, Den, Bedroom, Family Room, Kitchen, Bath, Kids Rooms or a baby Nursery. Softer than real sheepskin and no matting like Flokati rugs are so prone to. Real sheepskin also contains oils that make it especially susceptible to collecting dust and dirt. You wont have that problem with our Furs which are also much softer. Hand Wash in Cold. Lay Flat or hang dry. Our rugs can also be machine washed in cold water and gentle cycle. A Good Shake between cleanings will remove dust and debris as well as add fluff and texture. Call 714 403 5286 for a quick response. Most items ship within 2 to 3 days after order is placed. Some may take a little longer to manufacture. If you have questions please contact us through ARTICENTS or call 714 403 5286 for a quick response. Thank You. This item ships from United States. An additional charge of $14.99 will be added to each order for the current item.